For the second time in the same week, I am addressing the subject of Nabi Daniel Street in Alexandria, first discussed its famous synagogue, and now I wish to write about its book market. As part of the cultural heritage of Egypt’s second largest city, this street was the subject of a vicious—and frankly barbaric—assault from the new Islamist governor. 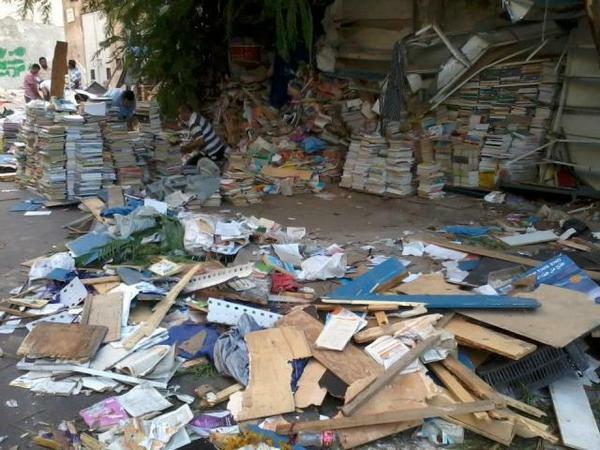 The Alexandria security service chose the early hours of Friday morning to carry out its assault on the old book market. The attackers did it in style, too; they destroyed the kiosks and threw the books savagely into piles of rubble in the street and then left without even providing an explanation to the distraught owners who depend solely on these kiosks to earn a living. For decades, books have lost their charm and appeal in Egypt and became considered a luxury that many cannot afford. Books on shelves that were once an essential part of any middle class family home were sold, mostly to bookstalls (like the one on Nabi Daniel Street), to allow room for extra bedrooms or lounge spaces or worse, were considered a threat to be avoided or even destroyed. The story of Nabi Daniel’s destroyed bookstalls involved many subtle yet crucial changes that have transformed Egyptian society over the last six decades from a nation of book lovers (even among the illiterates who respected books and wished they could read) to a polarized nation of either satellite TV fans or zealous opposers of both (books and other media), despite our shameful literacy rate of 66%. However, there was still a minority that loved books, either posh elites who could afford expensive books or others who loved reading but could not afford to buy new books (like me). For the latter group, bookstalls in Cairo’s Azbakeya book market and Nabi Daniel in Alexandria were invaluable. My mother—who used to eat only once a day in order to afford to feed me three meals a day— encouraged me to develop a love for reading and to seek knowledge. She regularly took me to these stalls to buy wide varieties of books at a fraction of their original price. Old magazines had a market too; many families earned a living by buying old editions of fashion magazines and then designing and making low quality dresses to sell for a fraction of their regular price. Today, these customers have lost one of the few outlets through which they could obtain what they need. Not to mention the suffering of the owners of these stalls, whose source of living is simply destroyed by these destructive acts, acts that even a dictator like Mubarak has never dared to perform. Recently, the disdain toward books has transformed to an active campaign of destruction, from Sufi shrines and libraries in Libya to Nabi Daniel in Alexandria. Rather than focusing on deteriorating security, pollution, and illegal building, the newly appointed governor choses to start his rule with assaults on the poor and their only access to knowledge. It seems that short-sightedness is not only a medical condition, but it can also be a political mindset. It is no secret that there is no admiration for certain books among many Islamists, from works of major philosophy, history books, western literature, to romantic novels. For them, it can corrupt the mind of Muslims and distract them from pursuing religious studies. However, very few of them have actually bothered to write about what they dislike about western literature, and the few who did wrote very superficial, reactionary accounts that are not even worth reading. From Naguib Mahfouz to Salman Rushdie, I have yet to found a well-written book to counter Rushdie’s claim or articulate what exactly is anti-Islamic about Mahfouz literature. I guess writing is by far a harder task when you can make the same statement through destruction and assassination attempts. In fact—even better—violence could achieve better results than intellectual discussion, as it terrorizes others and deters them from their quest for knowledge! However, I prefer to allow the pundits to answer the question of why exactly Islamists hate books. The “experts” in Islam and Islamism who regularly defend illiberal democracy, Morsi’s theocratic tendencies, and his fairy-tale promises should let us know how the destroyed bookstalls fit in with the revolution. Why are these used books perceived as a threat by some? Is it a question of law and order (bookstalls permission) or there are other motives behind what happened? Our clever pundits, who, thanks to books and literature, have earned various academic degrees and advise think tanks about the Arab world, did not devote even a tweet to the distraught owners of these bookstalls. Perhaps they are too busy dealing with far more pressing issues, such as redefining political terms, in which subtle theocracy is a civil state, backwardness is renaissance, and tyranny of the majority is the desired democracy. Therefore, and in that context, the destroyed bookstalls are simply irrelevant. This entry was posted in Egypt and tagged Alexandria, Egypt, Morsy, Muslim Brotherhood. Bookmark the permalink. Excellent article. There is every reason to view this with concern. Tweeted and following. thank you so much. I was so saddened by this and really felt for these people, and the readers who rely on those stalls. I cannot always afford new books, and also I find books at those stalls you would never find elsewhere. My books are my treasure. In the 1960s/70s I grew up in Australia and we had books in our home, but not many, they were not a priority. Among them was a set of pre-WWII encyclopedia that I would sit reading with my Grandfather. These were where I first learnt about and saw black and white photos of Egypt. 40 years later, I live here. As I became a writer I would buy books and music in preference to clothes or other things most people liked to spend on, and my library grew. When I came here I could not afford to move all my possessions from Australia, but half of the boxes that came with me were beloved books. In the small oasis where I initially lived, I hoped to eventually set up a bookstore / gallery / cafe. I am sure I had more books than any home there, and the children who came to visit were bemused by the piles of books. I was pleased to be able to give them some books and share others. My books also delighted adults that I showed them to. One photo book on Morocco which had captions in Arabic as well as English I showed to an old man who always greeted me daily in the street as I passed. He was intensely curious and wanted to know who each of the people in the photos was, and he was delighted at the similarities he saw in this book to his life, and the differences. As I have little Arabic and he has no English we could not understand each other much, but that book helped us communicate more. I will also be tweeting your post and sharing on Facebook and my blog. I do not want to see this go unremarked among the changes that are happening here, and I don’t want to see more such incidents happening that are basically against freedom of speech. I live in Egypt and I have to say that I am appalled at the literacy rate here!!! The girls seem to do very well but the boys are failing miserably!! One child in our house is 10 years old and cannot read or do anything beyond ‘adding’ in maths!!! Nobody here reads, except for my husband who used to be a journalist. My own feelings are that the Islamists are happy to keep people stupid and listening only to their idea of reality! People are easier to control that way! You know how it goes! How tragic. What more can be said of a government’s ignorance? Hello. This is a great tragedy but there is a precedent. In 415 AD, the archbishop Cyril ordered the famed Library of Alexandria burned and the ibrarians were flayed alive. The fear of knowledge being given the populace is an age old problem among many civilizations. Knowledge is power, and those who know how to use it have the advantage. The Islamists know this and are trying to restrict reading only to the Qu’ran. If people cannot afford books they will not buy them, but this is an out and out attempt to control people’s lives by robbing the vendors of their livelihood and denying their customers access. Here in the U.S. there are people who think the Bible is the only book anybody should read, but the Constitution forbids them from trying to control what people read. The only thing free thinking Egyptians can do is to throw out the Islamists. I was in talk to do a very exciting art exhibition with the women in their Art Guild in Cairo and I hope for a day when this will be possible ; where creative free speech is restored to everyone in Egypt! agree. Thanks for reposting my blog. You are welcome. Sorry about the double-post I did not realise when I reblog they repeat the comments.